Dr. Renato Aves is proud to provide the highest standard in dental implant treatment — Nobel Biocare® All-on-4™ — for patients who have lost all of their teeth on the upper or lower arch or will soon be losing all of their teeth. This remarkable solution is called “All-on-4” because a hybrid denture can be fixed on as few as four dental implants. * The entire process of inserting the dental implants and having the hybrid denture attached can be accomplished in the same day. 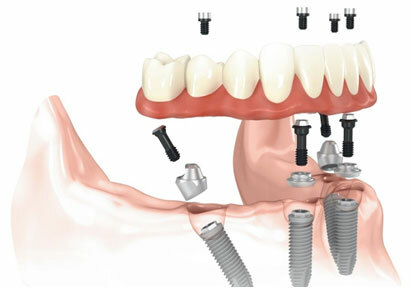 And, due to the unique design of the Nobel Biocare All-on-4 implant system, patients can typically receive this treatment without need for costly bone or sinus grafting. *A hybrid denture is a full denture (including prosthetic teeth and gum tissue) that completely covers the alveolar ridge and is firmly retained by a minimal number of dental implants. A full titanium bar supports the denture to ensure against breakage. All slippage is eliminated. Unlike removable full dentures, hybrid dentures do not cover the palate of the mouth. This means you will be able to taste and enjoy your food. Many patients forget they have a hybrid denture because it feels, functions, and looks much like a natural arch of teeth. Nobel Biocare’s multi-unit abutment allows for the tilting of the two back implants. This means longer implants can be positioned in the front part of the jawbone, rather than in the back where the bone is often resorbed. This reduces the need for vertical bone augmentation. Anchoring the implants in better quality bone improves support for the denture. The forward placement helps avoid critical nerves, and in the case of an upper denture, helps avoid the maxillary sinus. Both the upper and lower arch can be treated in this manner, although more patients are eager to replace their lower removable denture with an All-on-4 hybrid denture because removable lower overdentures have a great tendency to slip and become dislodged while speaking and eating. Dental implants preserve jawbone quality and bone density, and thus your facial structure and appearance. You don’t have to look 80 years old when you are 50 years old and become a denture-wearer anymore! You will once again be able to enjoy the foods you love and taste them as well. A very common complaint of denture patients is that they had no idea they would lose upward of 75% of their taste when the roof of their mouth was covered with a traditional full upper denture. The All-on-4 treatment eliminates the coverage of your palate and greatly improves quality of life. Eat what you want with confidence and enjoy your food once again. You will no longer need to use messy creams or adhesives to secure your denture in place. Dentures fixed on implants do not move. Slippage and gum tissue irritation are eliminated. The strength of your bite will be so increased that you will be able to eat all of your favorite foods. Your health will improve as you drink more water without fear of loosening your denture and as you eat the full range of nutritious foods. Hybrid dentures are so stable they feel and function like natural teeth. You’ll even brush them like natural teeth. With proper care, hybrid dentures that are supported and fixed on implants can last the rest of your life. To learn more about Nobel Biocare® All-on-4™ treatment for your mouth, Dr. Aves offers a complimentary initial or second-opinion consultation, which includes a 3-Dimensional, CB-CT scan. That’s a $450 value! You can regain full function and a confident smile. Call the Tampa Bay Institute for Oral Surgery and Dental Implants today for your free Nobel Biocare® All-on-4™ implant consultation. If you are missing all of your teeth or will soon lose all of your teeth on an upper or lower arch, Dr. Renato Aves will evaluate you for a hybrid denture using the Nobel Biocare® All-on-4™ dental implant system — today’s highest standard of care. For a textbook definition on Nobel Biocare® All-on-4™, read this article.